Mobile phones are designed to be locked down so they can only be used in a specific country, or on a specific network. This can be used by the network to increase their income by locking customers to one provider. Regulations and practices vary from country to country. In the United States, phones are generally locked to a specific mobile network code. Buy a phone through T-Mobile and it will be limited to operation on the T-Mobile network forever, or at least until you unlock it. T-Mobile in the U.S. will provide a subscriber with an unlock code if their account has been in good standing for at least 40 days and the customer has made no unlock code request in the last 90 days. AT&T, however, will not provide the needed unlock code until the contract is up. 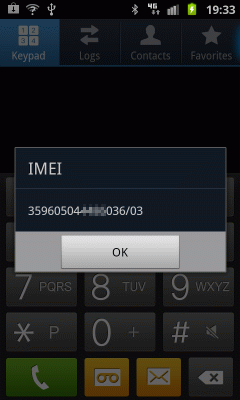 Dial *#06# to display the IMEI. 1: Looking behind the battery. 2: On most phones, enter *#06# on the keypad. 3: On an Android, look on the "Status" or "About Phone" screen in the Settings menu. The IMEI format as of 2004 is a 15-digit string in the form AA-BBBBBB-CCCCCC-D. The first 8 digits specify the model and origin. The first two digits of that are the Reporting Body Identifier codes, where mine starting with 35 indicates the British Approvals Board for Telecommunications in the United Kingdom. 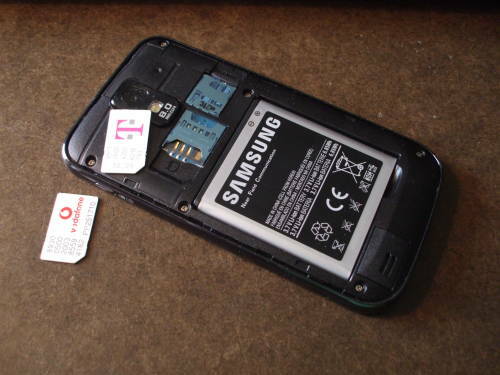 Strange, as this is a Samsung (Korean) phone built in China and sold in the U.S. by T-Mobile (German). CCCCCC is the serial number. D is a Luhn algorithm check digit based on the first 14 digits. The Luhn formula is used to validate various numbers like IMEI, credit card numbers, Canadian Social Insurance Numbers, and many more national identity number schemes. Do not expect the IMEI to be displayed in any consistent way! My phone's IMEI is really 35960504xxxx036. Dialing *#06# brings up a value with an added "/03" at the end as seen in the image above: 35960504xxxx036/03. The Status screen in the Settings menu displays just the IMEI: 35960504xxxx036. Original T-Mobile SIM lying on the phone, nearby is a needed second SIM. 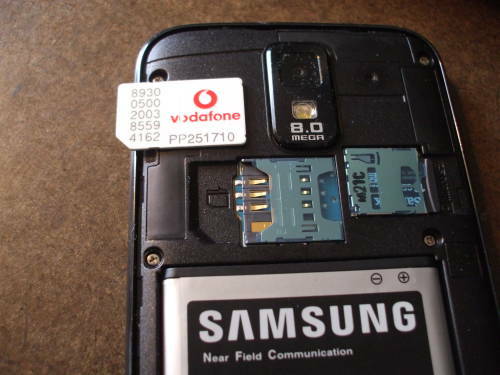 A Greek Vodaphone SIM left over from a trip to Europe is ready to be inserted. Call your provider and get the SIM unlock code from them. There are many sites on the Internet offering to sell you the unlock code. You probably want to avoid all of these! With T-Mobile, after you wade through the voice menus, you eventually get a human who offers to help. Be very careful to verify that they correctly entered the IMEI number at their end. Once you have the unlock code, remove the rear panel and slide the original SIM out of its slot. You have to have a non-native SIM to start the process. This doesn't have to be a SIM from the country to which you are traveling, any SIM from another carrier can be used. Find a friend with another carrier and borrow their SIM for a few minutes. To repeat, the SIM does not have to be from a foreign country, but it must be from a network other than the one to which your phone is currently locked. Here is a crucial piece of information that T-Mobile does not provide in the instructions that they e-mail to you with the unlock code: When you start the phone with the other SIM installed, you should see a simple display appearing roughly like the first one below. Do not proceed until you get the phone to boot to the first screen shown below. If you see this, you are not ready to enter the unlock code! See the text below for directions! If you instead see the second screen with the text Enter PIN code, you are dealing with a SIM that has a PIN. In that case, you must first enter the SIM's PIN to unlock the SIM itself. Only after that will the phone recognize that the SIM is from another network and take you to the Enter Network Lock Control Key screen. 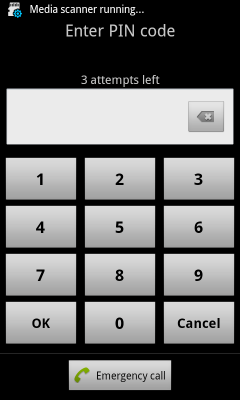 Tap in the wide empty field and a keypad will appear. Enter the 8-digit unlock code you received from your provider. Tap the Back button if needed to remove the keyboard and expose the Unlock button, then tap Unlock. The phone should now display Requesting network unlock... for a few seconds, and then you should see Network unlock successful. Now you are ready to purchase and install a local SIM. That may be a fairly complicated undertaking. Click here for details about getting and using that new local SIM. Good luck! It's needed when you have to deal with T-Mobile customer service. On my first call, they entered the IMEI incorrectly. A day later, I got an unlock code that would not work. I called again, waded through the same tedious menus, and got someone who "Oh, sorry about that, I'll get the correct code sent out to you!" I had to wait until the next morning, only to receive a message saying since I had put in a request within the last 90 days, I would have to wait for another 90 days and ask again. Calling service drone #3, I got someone who promised that they could fix it. I then got to listen for 15 to 20 minutes of her mumbling as she read through the instructions at her end. She finally figured out how to put in a request duly documenting that it had been their fault the first time. After yet another day of waiting for the 10:00 AM EST outbound mail, I got an unlock code that would work. However, their instructions are vague, and I had last used that SIM three or four years ago and had forgotten about the unlock PIN needed every time you turned on a phone with that SIM. I called once more and spoke to service drone #4. He was very polite but he had no clue that I was describing something that was not a feature of the phone itself. He sent me to "Technical Care", but not before trying to sell me extensions to my existing plan. Once I finally got him to realize that I wasn't interested, he forwarded me to the mis-named "Technical Care" department. At that point I was connected to service drone #5, an angry woman who snarled at me that the number ought to work, they don't really see SIM unlocking as their problem, and I should just fix it myself or put up with it. Then she switched to the booming voice all the T-Mobile service drones adopt at the end of the call to make sure that the recording captures them claiming that they have fixed the problem, "THANK YOU FOR GIVING ME THE OPPORTUNITY TO PROVIDE YOU WITH EXCELLENT SERVICE." Well, yes, you did have an opportunity. Too bad you didn't use it. Yet another call back in got me to the very first service drone in this entire sequence who recognized that "Enter PIN code" is not from the phone itself. This was person #6. She directed me to someone else (#7) who finally fixed my problem. All this took close to a week in total, probably two hours on the phone, dealing with seven people (only one of them overtly rude) before finding one who knew the fairly simple answer.